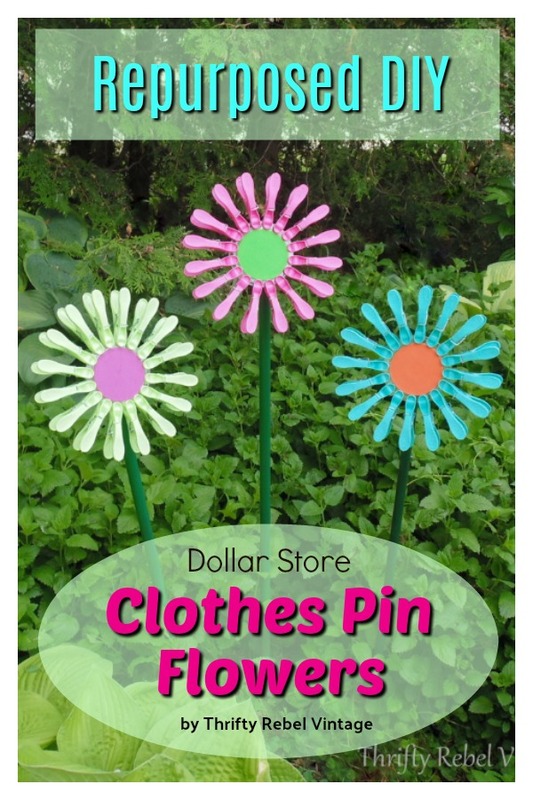 I haven’t made a dollar store project in ages, feels like years actually, and these clothes pin flowers came to me while I was casually wandering around one of our area dollar stores last week… looking for something, anything, that I could turn into flowers. From spring until winter I have flowers on the brain, as is also reflected (haha) by my recent tin light reflector flowers. What can I say? I’m a child of the 60s. Flower power and all that good stuff. lol. 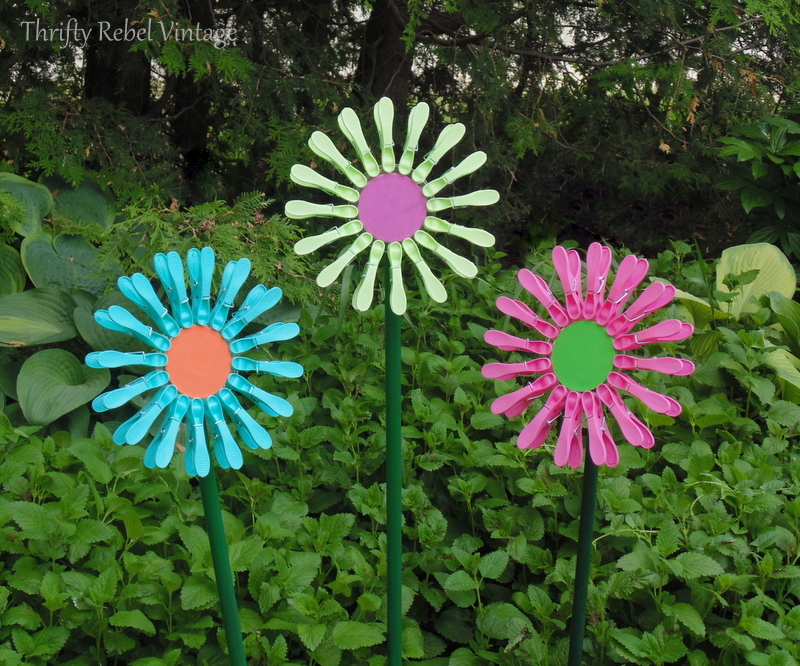 This particular dollar store trip came at a perfect time, because of this week’s Thrifty Chicks garden art project challenge. I’m so excited to see what my blogging friends have come up with for this month’s garden art challenge. As I said I was wandering around a dollar store and I saw these plastic clothes pins. I couldn’t resist picking up a few packages, and I immediately thought of turning them into flowers. Just look at those lovely summery colors! 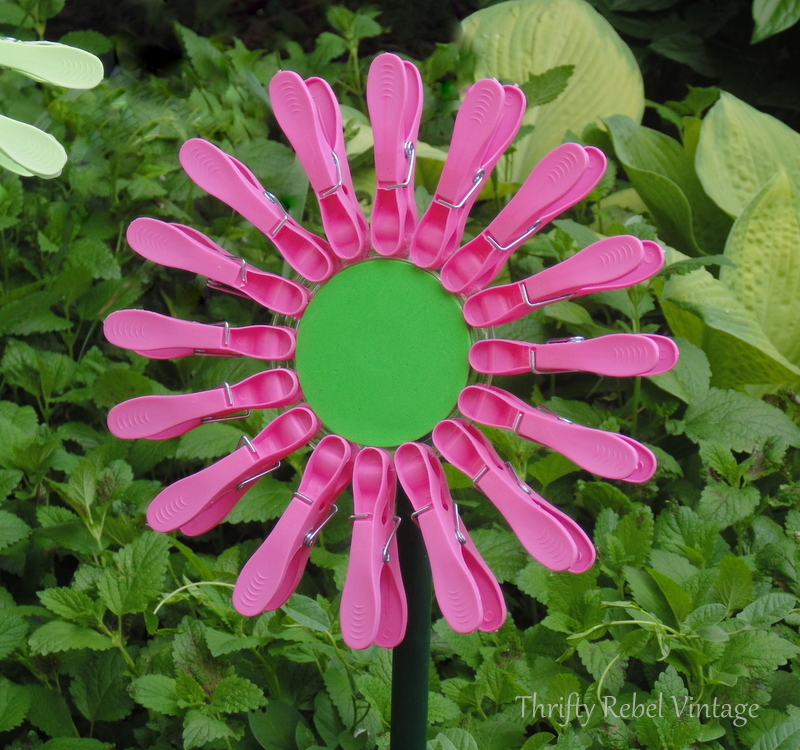 Once I had my clothes pins I started looking for something for the center of the flowers, and I found a $1 package of 4 plastic coasters. There were 4 different colors in the package… orange, green, purple, and blue. Perfect! 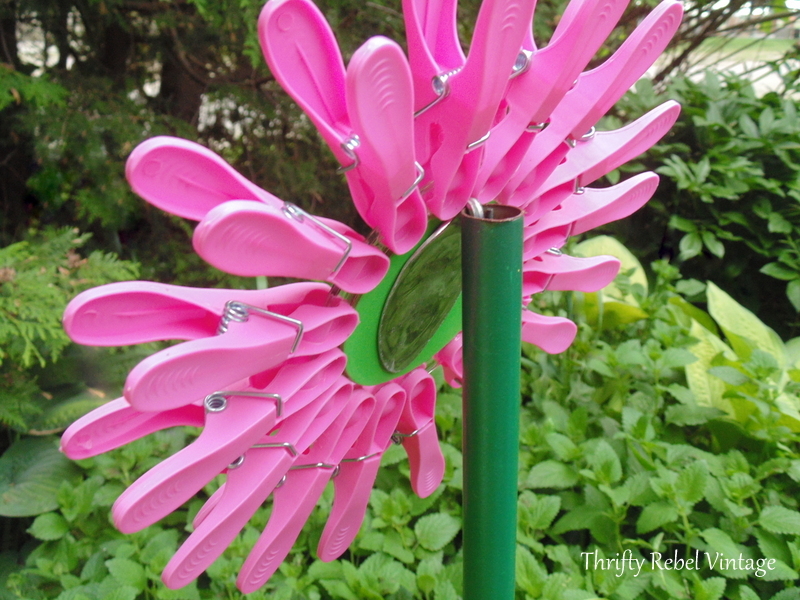 So to put these easy peasy flowers together you just start by clipping the clothes pins around the plastic coaster…. 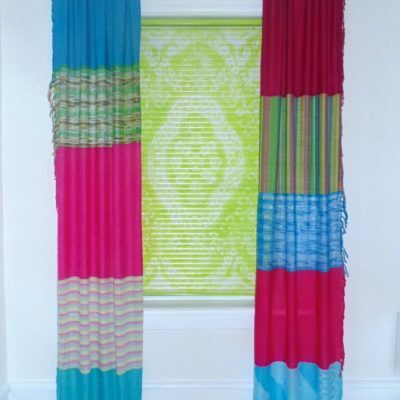 …until you have them placed and spaced in a way that you like. 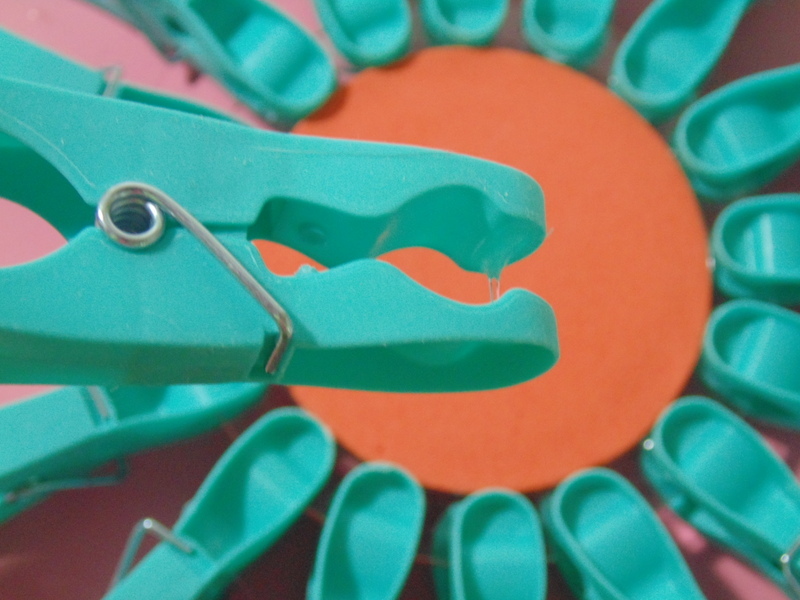 Then remove each clothes pin from the coaster one at a time, open them, and add a dab of E6000 glue to one side on the inside of the clip. You can also use Marine Goop adhesive. This post contains affiliate links. If you purchase something through a link Thrifty Rebel Vintage will receive a small commission, but it doesn’t cost you a penny more. See my full disclosure here. 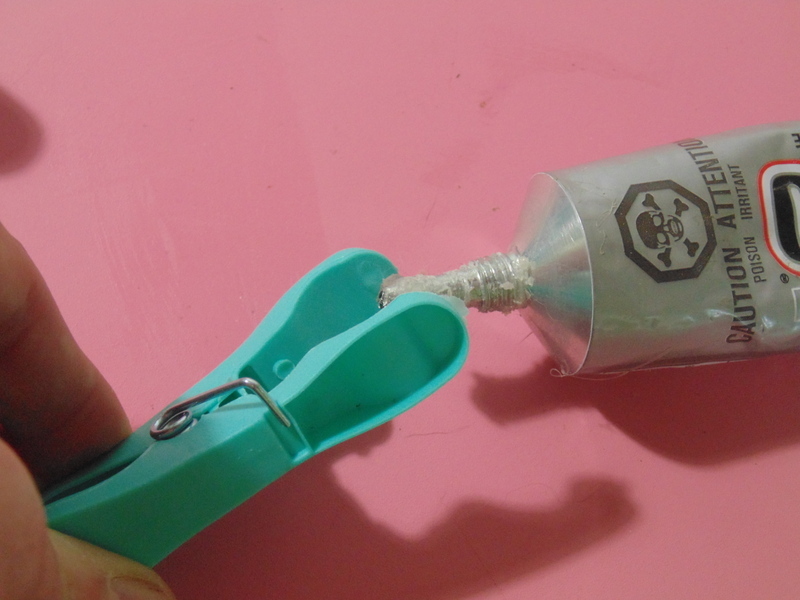 Then just close each one for a second just so the glue is on both sides of the inside of the clip. 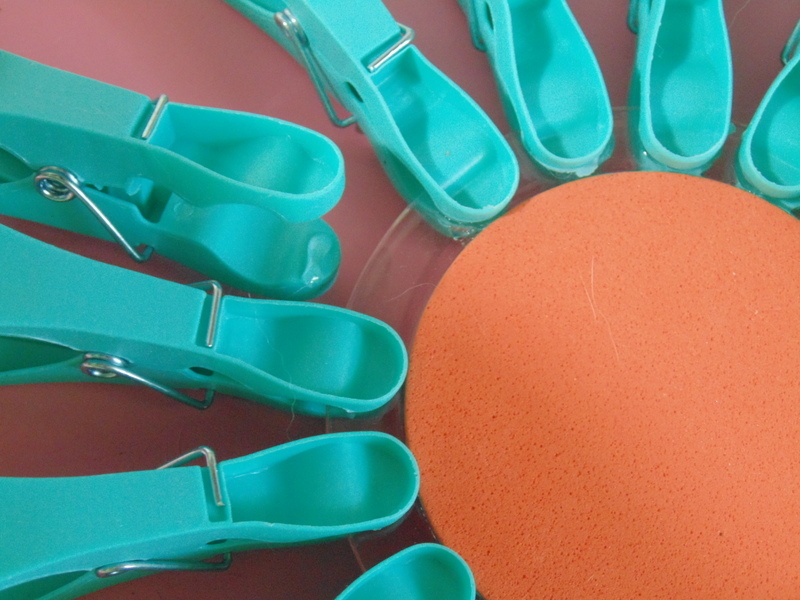 This way the clothes pins get glued on both sides of the coaster. Removing the clothes pins one at a time makes it easy to place them back in position, at least for me. If I had glued them as I originally added them to the coaster I’m not sure my spacing would have ended up looking very good. If you have a better eye than I do, then feel free to go for it all at once. To hang my flowers I’m using the same fancy schmancy system as I did with my repurposed folding strainer steamer flowers, good old fashioned stainless steel spoons that I flattened with a hammer and then bent. After gluing on the spoon with E6000 let the whole thing cure for at least 24 hours. And here are my finished flowers. The pipe pieces I’m using for the stems are from an old deck swing. 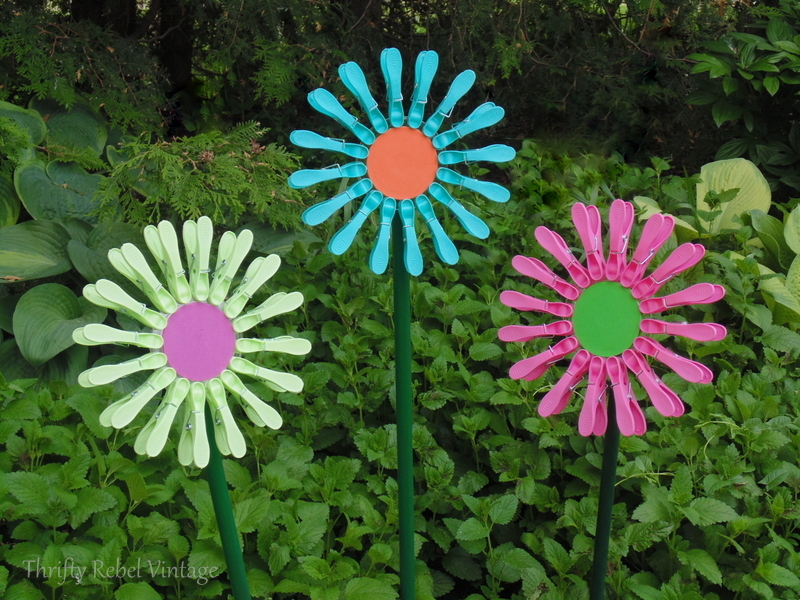 I spray painted them green and staked them into the ground a good 8″ so they’ll stand up to wind. 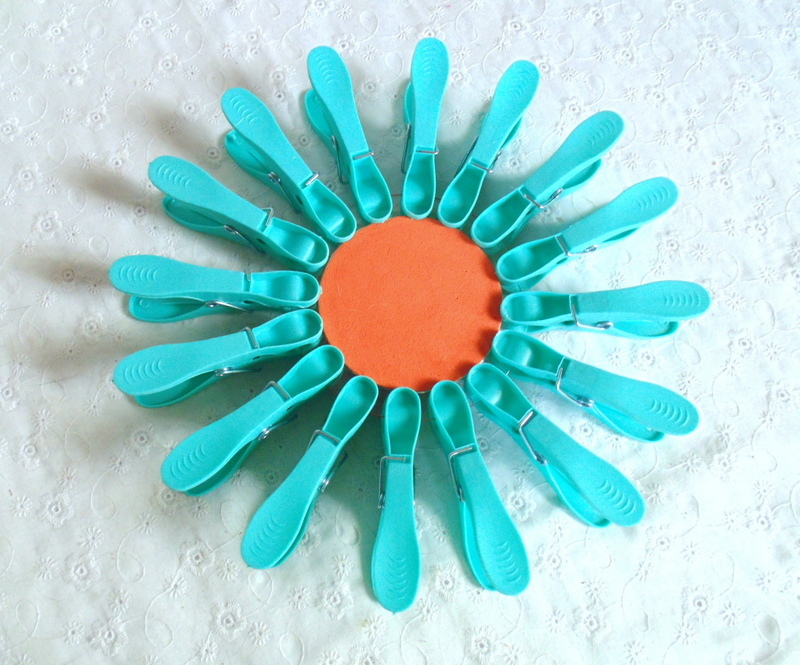 The spoon handles simply slip into the pipes. If you don’t have salvaged pipe like I do you can use copper pipe from any big box building store. Just make sure the size of the spoon handle will fit into the size of pipe you use. To stop the flower from spinning in the pipe on a windy day you can try stuffing a piece of a plastic bag into the pipe to keep the spoon in place, but that hasn’t been a problem for me. … but sometimes simple is best. 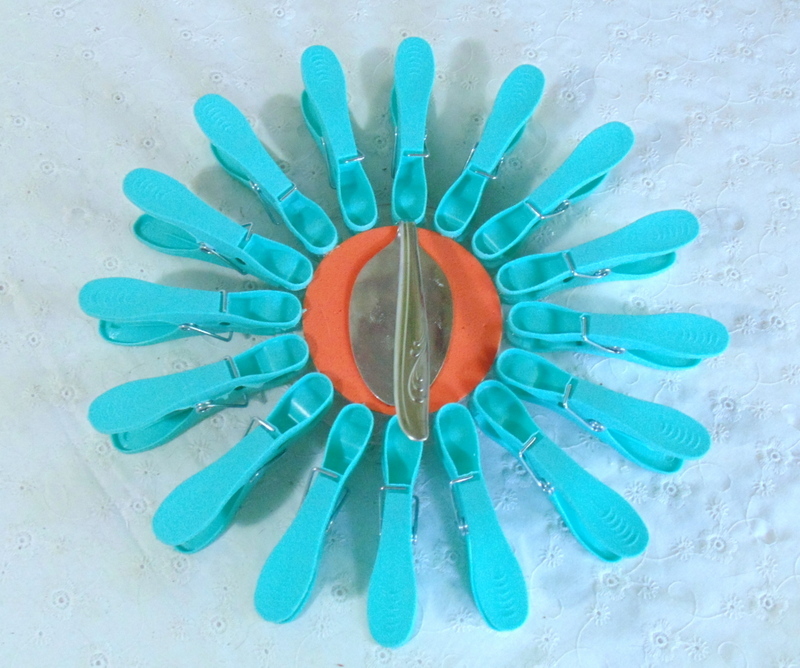 These fun colors remind me of Gerbera Daisies. So for a few dollars I have 3 fun flowers, and I still have the purple clothes pins and the blue coaster left. I have a thing for threes. lol. So they’ll have to wait. I have no idea how long these flowers will last in the rain and sun, but I’ve used E6000 on other outdoor projects with much success. I’ve put them in our shady hosta garden out front to add some fun color, and they won’t get too much sun exposure there. We can see them from the front kitchen window, and they greet us every morning when we leave the house to go to work. These flowers are super easy to create, and it’s always nice to start the day with something that makes you smile. 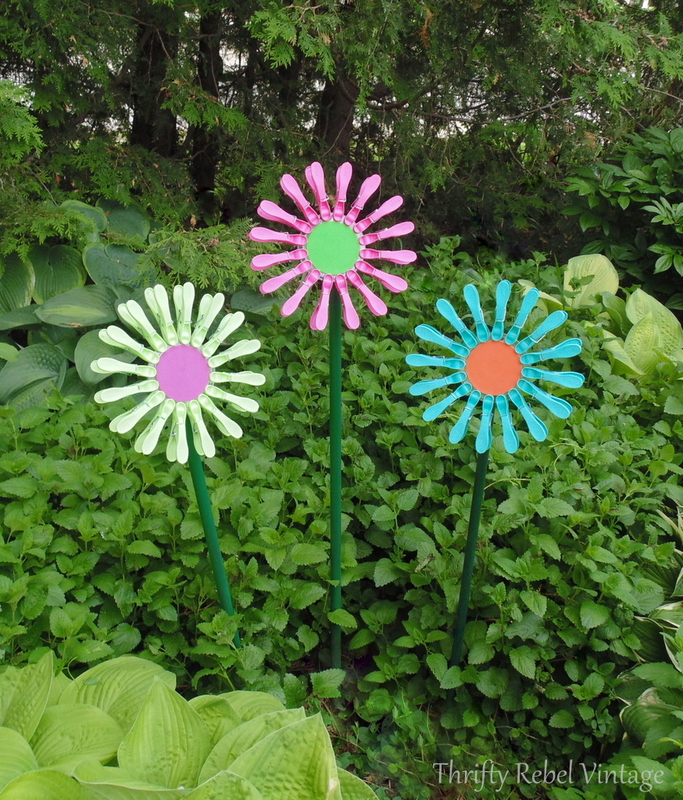 Now be sure to check out what my friends did with their garden art projects. Just click on the images below to check them out. 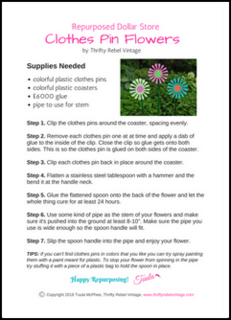 Subscribe to Thrifty Rebel Vintage and get printable tutorial worksheets like this one from my Members Only Resource Library. I’m adding more every week! So clever and cute! Thanks for sharing. 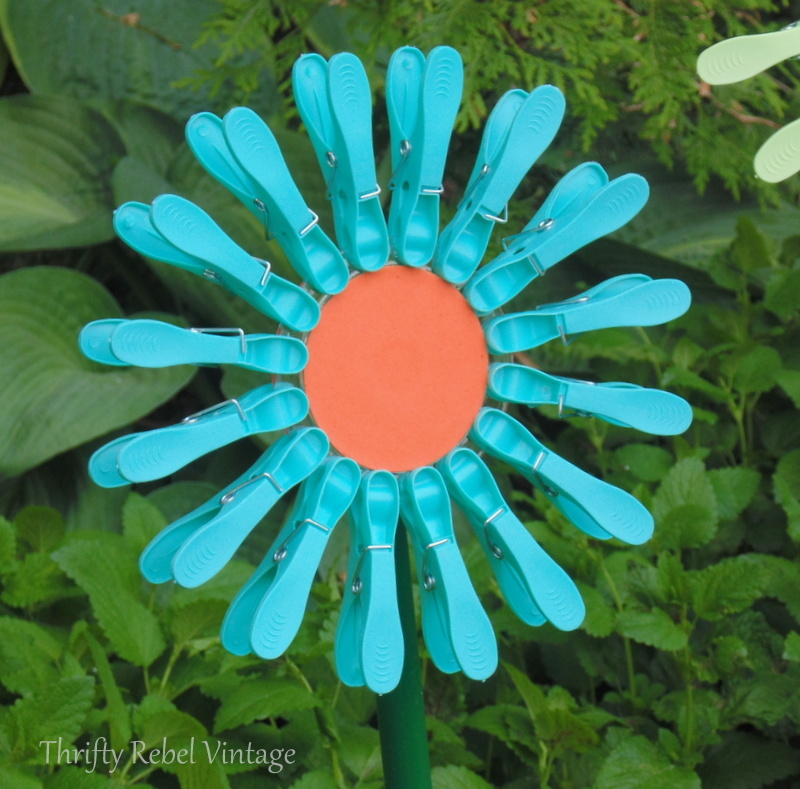 hunt down some colorful clothes pins and give this project a try! Tuula where did you find coasters and are they flat on the edges? 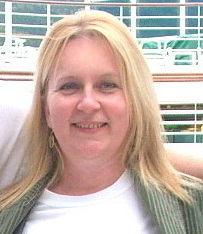 Hi Susan. I got the coasters at the dollar store as well, but you could use anything that’s round and flat. What an adorable idea. They are so bright and colorful. I really like your idea…..it turned out darling. You are so creative. Thanks Linda! It’s always fun to try to create things on the cheap. Oh I can’t wait to go to dollar tree! These look so fun! 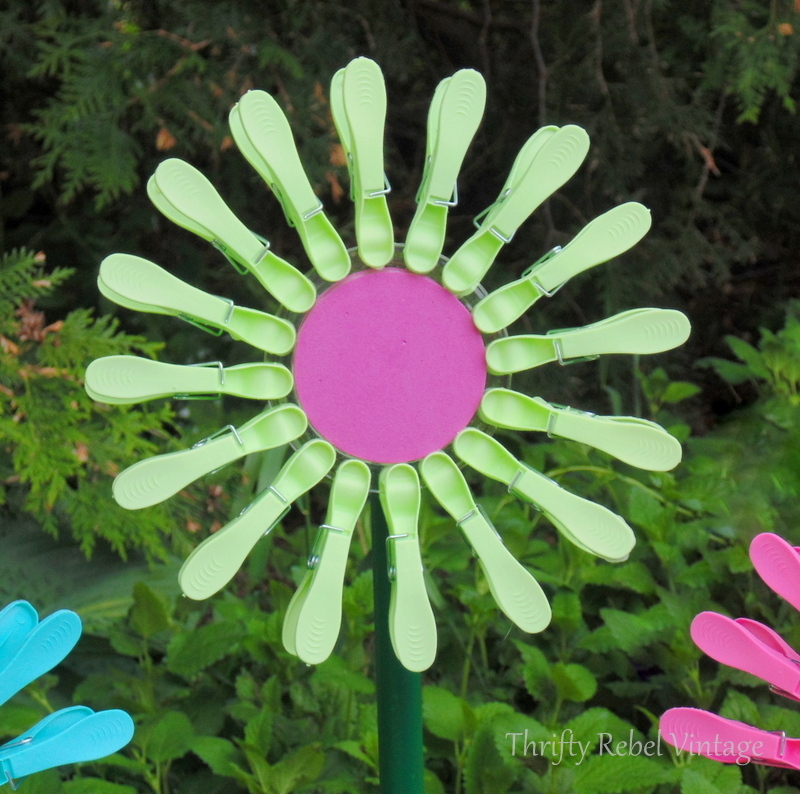 I need much more whimsy in my gardens and I think this will do the trick! I just hope my DT carry’s the pins and the coasters. Omg… You are killing me with all the adorable ways to make flowers!! These are so stinkin’ cute! Thanks Tania! Believe it or not I have more on the way. Just can’t stop making flowers. lol. These do scream “flower child”, Tuula! LOL I love how you took something totally mundane and transformed it into art! Always such great ideas! Thanks Lora! For me the most fun in this whole repurposing thing is the challenge of making cool things out of the ordinary, and that’s what I try to do. Sometimes I’m lucky and it works. These are so cute. You have the greatest ideas! Hope you are enjoying your summer…well actually spring for now lol. Thanks Marie! This project is probably the most fun I’ve had in ages, and it was so easy. What a cute idea! 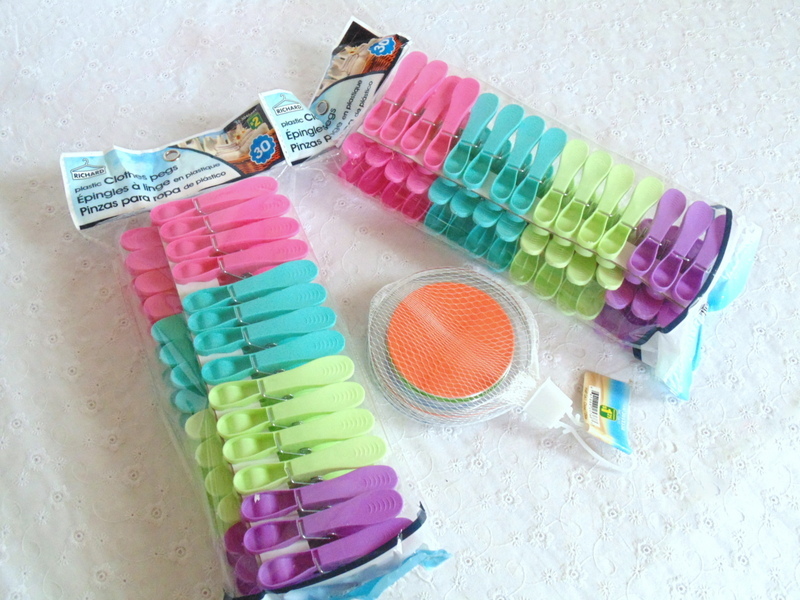 I have never noticed those colorful clothespins, but now I will be on the lookout! Thanks Amber! I had never noticed them before either, and I bet I walked right past them many times before I found them during other visits to the store. Thanks so much! I would certainly give it a try. If it’s hard plastic pipe you’re it will probably work. The important thing is that they’re pushed deep enough into the ground. Very creative! Love the colors. Thanks very much AnnMarie! It’s always nice to have some fun colours in the garden, especially a shade garden. Just Plain Love Them !!!!!!!!!!!!!!!!!!!!! Just plain love these !!!! I will search in vain for the clothespins. Thank you for sharing, you are so inspiring. Thanks so much Jean! I hope you find some of these fun clothes pins, but if you don’t find colours you love you could always spray paint them. Thanks so much Diana! Enjoy your time with your niece. I hope she does love them. Absolutely love these flowers. Where in dickens did you find those close pins/pegs. Which $ store did you go to? I know some areas have their own $ stores and that it wasn’t $tree since clothes pins were $2 each pkg. Love idea of using the coasters, how clever you are. 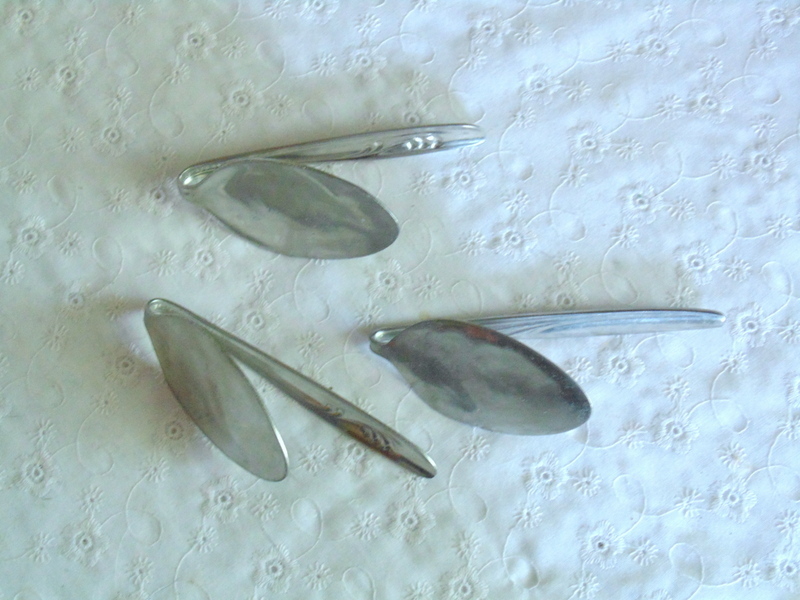 And using the bent spoons for holding/hanging the flowers in the pipes. 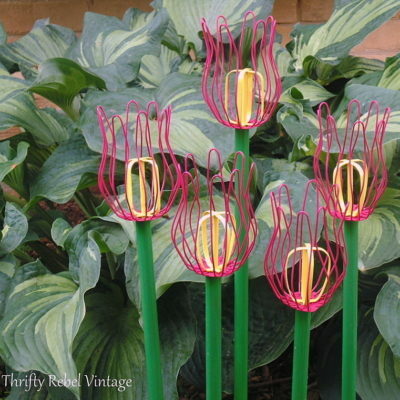 to make some for our front yard flower beds and by our front porch. The colored flowers are so pretty, happy and fun anywhere. When we get paid will be out looking for pegs and coasters to make some of these. So glad you shared this project,hope I can find something at least similar to what you used. 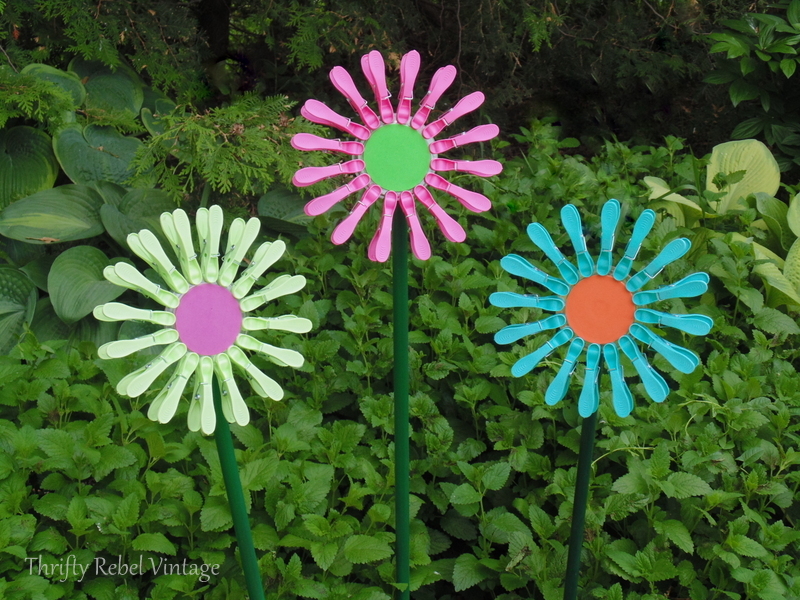 This is such an easy and inexpensive way to decorate the garden! I think they are fantastic!!! Thanks very much Susan! I had a lot of fun making these…. so easy.